By the way, most of the merchandise sold here was created by someone in the Leucht household. 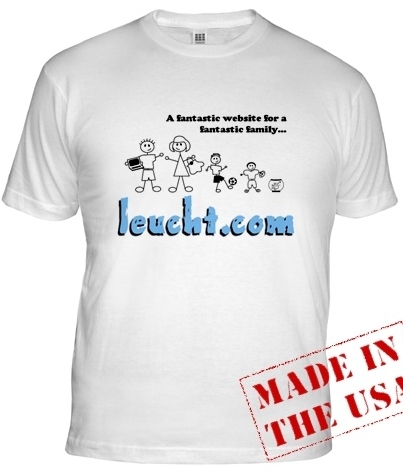 If you don't see any items or services at the leucht.com online store that you're interested in purchasing but you think we're nice people who deserve nice things, you may want to just give us some money anyways! That's perfectly fine with us ... just click on the Donate icon to send us some money via PayPal. Thanks! 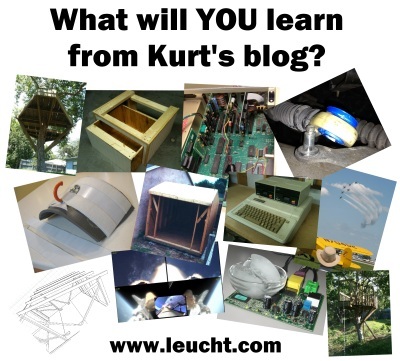 Kurt's Blog: What will YOU learn from Kurt's blog? 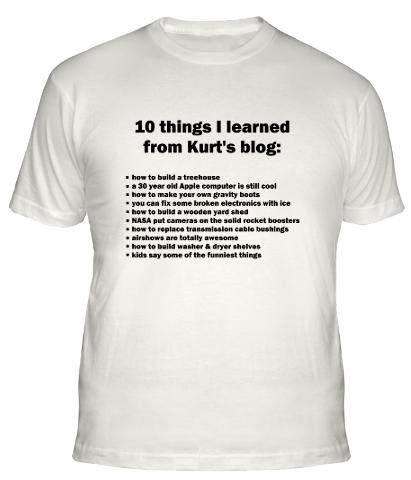 If you like Kurt's blog, why not help him out and show your geek pride by advertising it on your t-shirt? 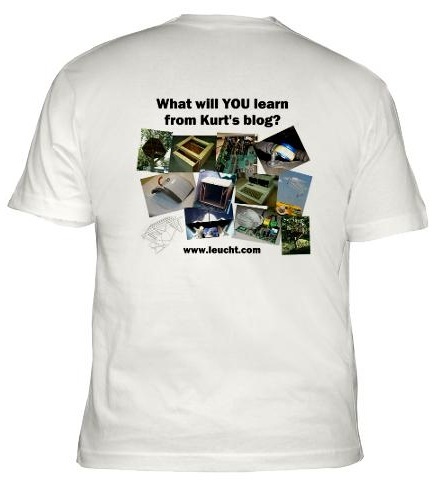 Check out the photos below for high resolution snapshots of the shirt designs. Deer Creek Mackinaw Class of 1988: 20 Year Reunion DVD Yep. Here's the video that everyone is talking about. Well, about 20 or so of my high school friends are probably talking about it, anyways. It's the hour long DVD that was shown at the Dee Mack class of 1988 20 year reunion dinner in September of 2008. You'd better pinch yourself because you can now purchase and own your very own personal copy of this remarkable tribute to Dee Mack's class of '88. For those who didn't get the opportunity to see it at the reunion, this video contains photo slideshows of the whole graduating class along with lots of wild and crazy snapshot photos. In addition, there's 20 year old VHS video camera footage from skit night, homecoming court, the homecoming football game, and a very special Bon Jovi music video featuring the pretend musical talents of Joe and Doug. And don't forget the unforgettable float parade during homecoming game halftime where there was some sort of famous mishap with the senior float! Yes, you must own this rare piece of Dee Mack history! Click on an icon to purchase your copy today! Dee Mack Chief refrigerator magnets It's common knowledge that you can never have too many refrigerator magnets. 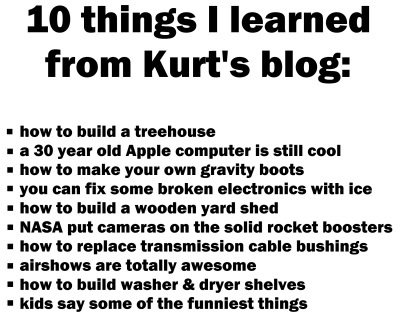 These things come in handy for holding up all sorts of stuff. They can be used at home to proudly display on your fridge your kindergartner's crayon drawings that highlight how bald you really are getting these days. Or they can be used at work on your filing cabinet to hold up that list of reasons the last software project you worked on failed so miserably. Or as a last resort, they can be used as hop-scotch markers. Yes, these quality fridge magnets really are hard to resist! Click on one of the icons to purchase yours today! 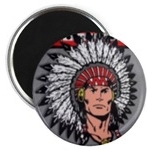 Did I mention they have the Dee Mack Chief on them? Dee Mack 1988 class photo merchandise Cool. Our famous class photo is forever emblazoned on a refrigerator magnet or a photo sticker that I can buy for a reasonable price. Are you kidding me? Is that really a poster sized print of our famous class photo for sale here? Have I died and gone to heaven? Wait just a minute here. Don't tell me I can buy a professional quality framed and matted print of our famous class photo to hang over my mantle! Oxygen! I need some oxygen here! Clicky clicky to purchase purchase. Dee Mack 1988 senior class float mishap merchandise In the fall of 1987, there was one man who carried a video camera everywhere he went. And that man's name was Al Hurt. Al was talented enough (or maybe lucky enough) to record the only known video footage of the unexpected senior float mishap which occurred during the homecoming game halftime float parade. Police reports coroberate that the video footage was not altered nor edited in any way. Using technology developed by NASA for the Space Shuttle, experts have been able to extract a single key video frame from this VHS footage and print that photo onto refrigerator magnets, photo stickers, postcards, and even greeting cards. If you act now you can own an authentic piece of Dee Mack history. This is a limited time offer, since I'm sure this magnet/sticker/postcard/greeting card printing company will soon go bankrupt for selling these priceless artifacts for such dirt cheap prices. 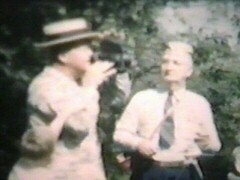 1950's Peoria Cinema Club Films This DVD contains four short silent films that my grandfather, Kurt William Leucht (1896-1976), helped create along with his friends in the Peoria Cinema Club. Over an hour's worth of films are included. These films were most likely made in the 1950's, although exact dates have not yet been determined. These 4 films are the only ones that survived 40 years worth of home storage in my grandfather's house and also in my father's house. More to come More old Peoria Cinema Club films have recently been found and will be digitized and sold here soon. Please check back in a few months. Lemon Blossom photo merchandise I snapped this amazing lemon blossom photo in my back yard a while back and I still can't get over its beauty. This amazing photo looks great on refrigerator magnets, posters, greeting cards, and even on tote bags! Check out the complete set of lemon blossom merchandise by clicking on an icon. 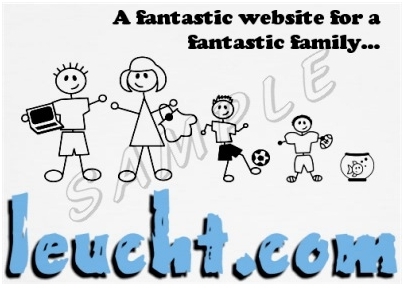 Leucht.com: Fantastic web site, fantastic family merchandise If you like our family friendly web site, why not help us out by advertising it a bit on your t-shirt? 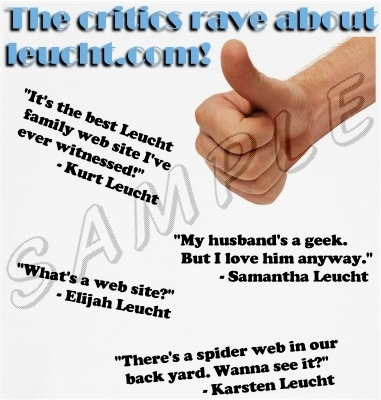 I hear this web site is getting rave reviews! 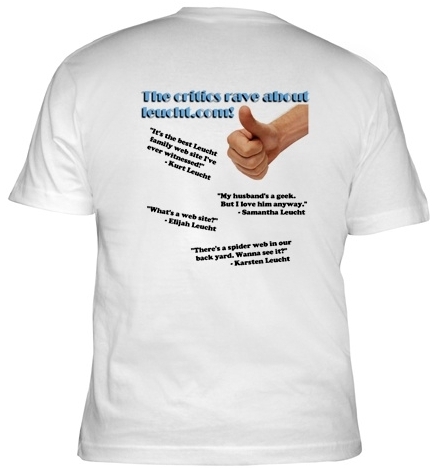 Check out the photos below for high resolution snapshots of the shirt designs.